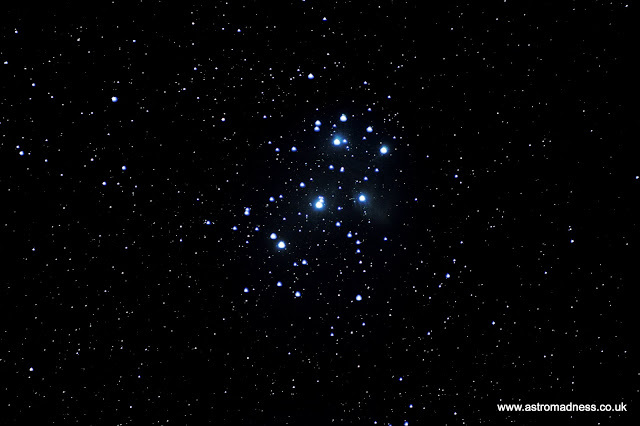 Clear skies have been very few and far between of late, and the opportunity to get under the stars has been nullified. So, I’ve had plenty of time to think about what I wanted to do next time clear skies presented themselves. Taking the decision to leave the SBT indoors, I decided to carry out a photography trial. Over the last 12 months, I’ve built up and made a small collection of equipment to help me photograph the night sky. The night of 11th December was forecast to be clear for 4 or 5 hours, so I set up the following kit list as it was getting dark. · iOptron SkyTracker tracking mount. · Canon EOS 1100D DSLR. · Small dew heater for the DSLR lens. · Laptop connected to the DSLR via USB. I’ve also recently bought and downloaded a copy of some photography software called Backyard EOS (or BYE). It’s a specialist piece of software designed to work with Canon cameras and Nikon cameras with astrophotography in mind. This was installed on the laptop. All the kit was set up outside on a table. There’s one thing that I’ve certainly learnt from my brief forays into astrophotography, and that is to make yourself comfortable. It’s going to take a bit of time and patience. I needed a target for the night. One that was easy to locate, so I didn’t need to spend any time to get into the view finder of the camera. 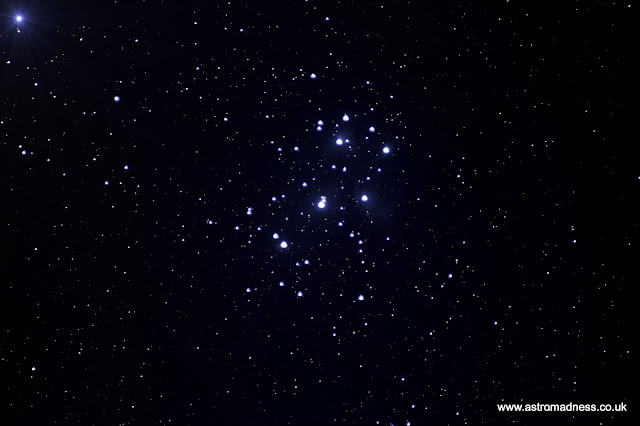 M45, the Pleiades currently sits quite high in the sky. 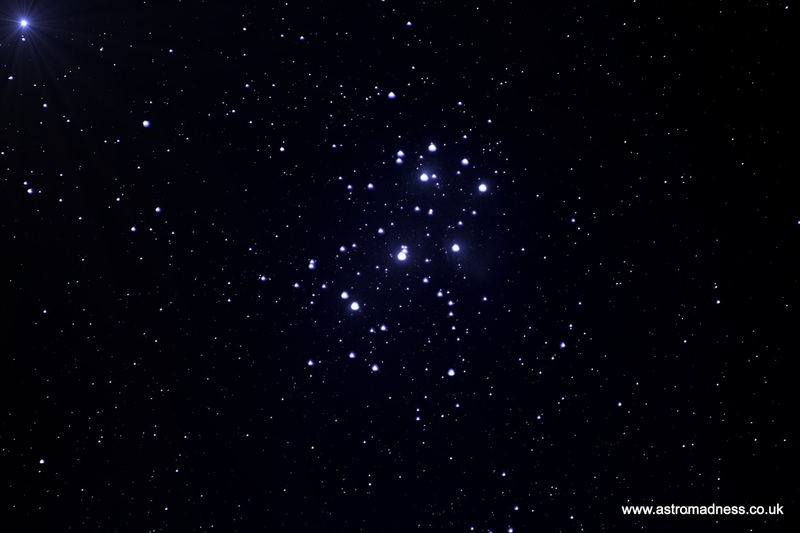 It’s one of the more popular Messier objects for observing this time of year and is a star cluster associated with some nebulosity. With everything aligned, and the mount tracking, I used the focus feature on BYE to achieve optimum focus on the target. Controlling the camera from the laptop made this very quick and easy. Previously, I have spent nearly an hour trying to achieve a good focus, but using BYE, the process took under a minute. BYE has the really cool functionality of allowing you to set up your whole imaging run at the start, so once the process is kicked off, you have very little to do with the setup other than keep an eye on the preview images as they are generated. Also, all images are stored directly onto the laptop instead of on the SD card of the camera. These were the settings I used for the imaging run. BYE also gives you an estimated time of the finish time of the image run. This allowed me to come back indoors, just going out to check everything every now and then. At the end of the imaging run, all the data I needed was on the laptop. My dew band on the camera lens worked perfectly, with not a sign of dew on the lens at all. The tracking mount worked really well to, and BYE performed without an issue. Money well spent. It was time to de-rig all the kit and retreat indoors. I transferred all the data I collected onto the home PC ready to start the process of stacking and processing. I used 2 pieces of software which are available for free to download from the internet. They are DeepSkyStacker and GIMP. The internet is awash with guides and tutorials on how to use DeepSkyStacker, so I won’t go into it here. It can get quite confusing, but there are some basic steps to do that will get you a very good image. So far, my decision on how many Lights, Darks and Biases has been a bit of an educated guess taken from reading about the results that others have got. With the data all on the home machine, I have been able to compare results using different amounts of Lights, Darks and Biases. This first image used all the data collected to create the image, leaving any omissions up to the software to leave out. This second image was created leaving out 3 of the Light frames that were very low scoring, and some frames that showed signs of camera movement, probably down to me accidentally nudging the tripod or camera when moving around in the dark. I also reduced the number of Darks and Biases to 5. Initially, there is very little difference, but after going through some post processing, I was able to bring out a bit more detail in the nebulosity around the stars. I think this was down to using less Darks and Biases for the second image, there for not making the background sky darker that it actually needs to be. I’m very pleased and proud of the result given that this was my first full process using all the kit that I have brought together over the last 12 months. I’ve got a few other targets in mind and I hope to get a chance to image them during the winter.